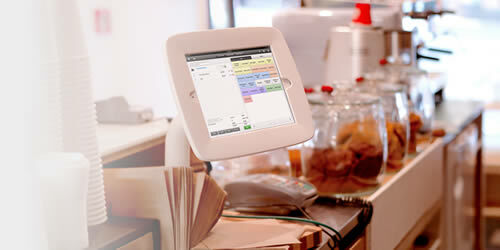 Vend brings to the retailer what it calls web based point of sale (POS) that replaces the old fashioned till point. Originally from New Zealand, the company does most of its business in North America, Australia and Europe and a has a vast customer base that includes the Fashion, Sports and Outdoors, Health and Beauty, Food and Drink, Tourism and Adventure, and Home and Lifestyle sectors. In a nutshell Vend's product provides a simple sell screen that works online and offline complete with detailed product information and a handy customer management tool that runs along side. Stock order, transfer, stock take and records are all incorporated, and anything else that might be desired by the retailer, like ecommerce or appointment scheduling, is provided via intuitive product add-on applications from Vend partners. Conveniently, because it is internet based and only needs a web browser to get started, Vend works on most devices offering both a static and portable solution. Mac, PC, iPad and Android can all be used as well as a mouse and keyboard, or touch-based input. To keep things simple and affordable for the retailer, Vend is designed to work with retailers' existing peripherals such as a receipt printer, cash drawer and barcode scanner, which can be connected wirelessly. Vend is suitable for retailers with one store, selling up to ten products to 1,000 customers, through to those with multiple stores with 50,000 products and as many customers. Vend has a lot of cafe and coffee shop, and small bar customers, but its systems isn't yet suitable for larger bar/restaurant business that require bar tab and table management tools; nor does it have any partners that provide such functions. Vend does claim to have this on its radar and reports that it is currently working on a great partner add-on solution which it hopes to have live very soon. Although Vend works well with Android it has a fatal flaw in that printing from Android via Cloud Print is not yet supported by any brands of thermal receipt printers. So while Android will work great as a standalone POS, for email or no receipts, it is not currently possible to set up like a traditional Cash Register / Printer / Drawer. Vend also doesn't support 58mm wide thermal receipts or the serial/parallel adapted to USB printers. What features does it offer the retailer? This handy item lets the retailer see live sales and product information at a glance. Product, sales, stock and employee reports can all be set up for the retailer to track directly from the customised dashboard. Retailers can choose how they wish to take payment, and offer just cash or the whole package of cash, card and mobile. The methods they select are added as buttons to the interface. Cash including split payments, layby and account sales come as standard, but to accept integrated credit and debit cards or mobile payments, retailers need to use one or more of Vend's global merchant partners that are incorporated into the system as an add on. If integrated payments aren't necessary, retailers can continue to use their previous merchant providers. They just manually enter the details into the card reader, and use a non-integrated payment button in Vend. Vend also works with any currency. To make a sale as simple as possible, Vend offers Quick keys for the most popular products that can be added as buttons to the retailer's sell screen for easy access. The retailer can choose what products appear and arrange them as they like, and also add colour, tabs and pages. To complete the sale in a professional manner Vend offers retailers the opportunity to create a customised receipt containing the store logo and website that can be emailed to the customer or printed onto the spot via the in-store receipt printer. Receipts can be designed in advance and saved as a template to ensure the retailer has one ready-made for every sale opportunity such as quote or even a sale in another language. Vend has developed a very straight forward product management tool that makes it easy to add, edit and remove products, including images, stock levels and pricing including tax, and to also create unique barcodes for each one. It provides three types of variant per product, so retailers can outline pricing by discounts, sales and even different price by location, and descriptions by category, size and colour. In addition, Vend has created a product type that it calls ‘composites' which is basically a bundle of products put together to form a new product like a gift basket. There are a few ways to import and export products; a CSV file in Open Office, Excel or Google Docs, a third party add-on application like Shopify store, or by a barcode scanner are Vend's suggested methods. Vend's inventory management tool aims to make purchase orders, transfers and stock-takes an easy process through automation. Stock levels are automatically handled through adjustable reorder and restock counts that tell the system when to place an order or restock shelves. Product stock reports are also on hand to guide the retailer. The mobile ability of Vend comes in very handy for stock take enabling retailers to count products directly into the system as they walk through the warehouse or shop by using an iPad and barcode scanner. For multiple stores in need of multi-location stock control, Vend allows retailers to check product levels and place orders from other locations and makes the necessary stock adjustments automatically. 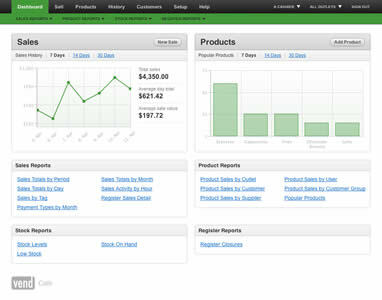 Vend has devised a comprehensive customer relationship management tool. 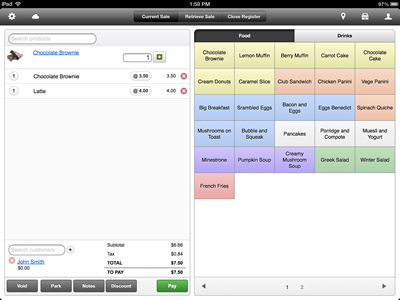 New customers can be added at the point-of-sale, or imported using CSV file, and various data recorded like custom fields, social media accounts, rich text description, and an email address. The customer's payment history and current balance is just a click away, and all data can be exported for reporting or marketing campaigns. Retailer's that are keen to run customer incentives can simply switch on Vend's loyalty programme that lets customers earn loyalty points on purchases to be redeemed later as credit. Retailers can also offer loyalty rates on products. The points balance is printed on receipts and also viewed by staff via the sales screen. To provide a wide variety of services to retailers Vend chooses to integrate third party, expert solutions into its system such as Xero, online accounting system; Stitch Labs, for e-commerce shopping carts and marketplaces; Timely, appointment scheduling software; and PeopleMine, an advanced reporting, customer management (CRM) and business analytics tool. Currently Vend has about twenty add ons that retailers can take advantage of. On its own Vend is a basic POS system with an affordable pricing structure, but its partner add-on features are what turns it into a fully functional POS system. Unfortunately, Vend doesn't mention the costs involved in using most of its partners for these add-on services and therefore the final package is likely to be a lot higher. It does have a combined pricing structure available for Timely however, which is used for cloud-based appointments and POS for salons, spas and clinics. Despite this, the chances are that it will still remain a cheaper option than many other POS systems out there. All accounts include one free register. Additional registers can be added to medium, large and extra large accounts at any time for £15/month if billed annually or £18/month if billed monthly. Premium support that provides personal set-up assistance, on going training and phone support is available with medium, large and extra large plans at £24/month when billed annually. Vend is a very simple point of sale solution that provides retailers with automatic access to intuitive features with no complicated maintenance, upgrade or expensive support contracts. Vend is compatible with the latest technology so that retailers have the option to use modern equipment like the ipad and say goodbye to the out of date equipment that could potentially be costing a lot of money to maintain. Retailers don't need to worry about losing any sales data or not being able to operate should the internet connection go down. 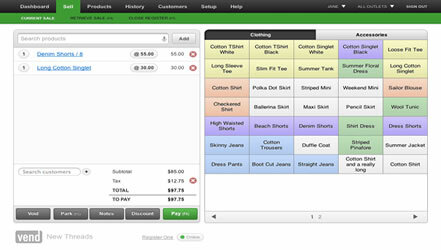 Vend has developed its product to work both online and offline so they will never miss a sale. Data security is high on Vend's priority list and to give peace of mind to retailers it has invested in the same technology used by banks in order to keep data updated and secure. Vend offers its customers access to a free online support area that is packed with useful material like training videos, webinars, forums and updates. Are there any downsides to Vend? On the surface Vend appears to have an impressive, highly flexible solution that can meet with many retailers’ needs. However, the company only launched in late 2010, so they haven’t been around all that long and as a result the software is constantly being put through its paces. While frequent updates or bug fixes are an indication of software that continues to evolve and a good company will always continue to develop its product, on the other hand, as Vend boasts of a beautiful appearance and uses many third party applications, perhaps the company initially invested more into form than function. What’s more, while Vend delivers innovation through best of breed product add-ons, this also leaves the door open to integration issues and retailers should be aware that depending on the popularity of the add-on some of the niggles they experience might not be a priority. In response to this Vend told us that it isn’t doing anymore native integrations. So if there is any issue with an add-on, it won't affect the app's core performance and won't have anything to do with the developers or be up to Vend to fix. Access to moderated community support where the Vend team endeavours to reply to 85% of community forum questions within 3 days of posting. Email support is included with all paid monthly subscriptions and paying customers requiring assistance can send direct email or ticketed queries to Vend's support team for individual support. Vend support desk endeavours to reply to 85% of issues submitted by email or web ticket within 8 hours, but please note that this is during New Zealand business hours only. Premium support is an additional, paid support option for Vend customers that can receive phone support, complete initial Vend set-up and ongoing one-to-one training. Despite Vend’s support offer, retailers are still having to use different suppliers for hardware and software with no single point of contact, and may find themselves in the situation of one supplier blaming the other. The safest route is for retailers to opt for support by certified Vend partners that offer a full support package including onsite support, setup assistance, email & phone support, hardware packages, setup and support, training and integrations and 3rd party add-on assistance. Interested in Vend? Why not get in touch to discuss your requirements?